Agricola Redesign | Five Fab Ideas for Gift Wrapping! Five Fab Ideas for Gift Wrapping! These festive bags and greenery are available at A Village Gift Shop in Glendale! 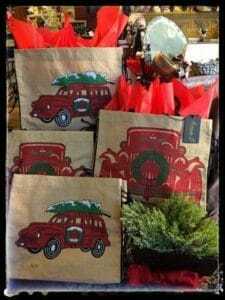 Holiday gift bags available at A Village Gift Shop in historic Glendale. Don’t be the person who waits until the last minute and resorts to wrapping in newspaper (although, Pinterest does have a few cute ideas if you do!). This year, be the one who takes gift wrapping to a new level. Wrap your gifts to match the personality of the person you’re giving the gift to. Or, think about matching the packages to that of your home decor… these gifts are going to be sitting under your tree for several weeks after all, so why not have them complement the space. Go with a stamp or stencil: Purchase inexpensive Kraft or butcher paper and give it an artistic look by adding a stamp or stencil design. The butcher paper is the perfect canvas for you to give it your own flair. You’ll also feel the savings in your wallet when it comes to purchasing rolls and rolls of paper, and your friends and family will love the DIY touch you give the gifts with stencils and stamps. Get outdoorsy: One of the biggest fashion trends in the winter is red flannel. Give a new twist to this menswear-inspired look by making your gifts look outdoorsy with their wrapping. 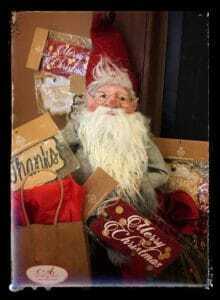 You can add fresh greenery for a wintry, woodsy feel and a rustic topper will give the gift a “manly” feel. Use fabric: Rather than opting for the ribbons that are hard to mold into bows, use leftover fabric sitting in the storage closet. Not only will it save you from having to throw all that fabric away, but you’ll also give your gifts more of a fashion-forward look as well. You can also use upholstery fabric to create the bows on your gifts as well. We have lots of holiday items at A Village Gift Shop to help you check off everyone on your gift list! Get colorful and glamorous: When it comes to wrapping gifts, you don’t have to stick to the traditional holiday colors of red and green. Think outside the box and go with purple, white, blue, or any other color that tickles your fancy. You’ll find that there’s a sophisticated twist on colorful gifts that may otherwise look traditionally boring under the tree. But while we’re on the topic of colors, don’t limit it to traditional colors. Don’t be afraid to use hot pink, gold, and even glitter to give your gifts a fabulous look. Give it layers: Don’t just wrap your gifts in paper and be done. Give your presents layers by create 3-D Christmas trees to glue onto the package or opt for textured ribbon and greenery for a custom wrap-job. 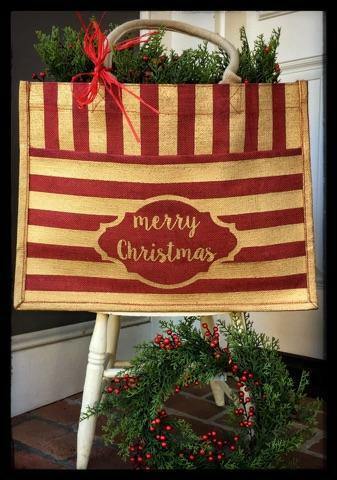 Be sure to stop by A Village Gift Shop in historic Glendale to pick up your Christmas gifts this holiday season. We have a huge selection of gifts, apparel, accessories, and home decor to choose from including Alex and Ani, Mud Pie, Rookwood Pottery, and Maruca! Learn more at www.avillagegift.com or by calling 513-771-3927.